The Rallynuts Stages Rally (formerly known as the Severn Valley Stages) is one of the most popular stage rallies in the UK and has a enviable heritage in the sport. Find out why below. 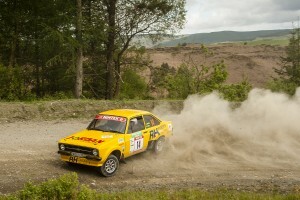 Originating in the early 1970's this club stage rally has endured the test of time and despite name changes in recognition of different sponsors continues to be a firm favourite with competitors. The event started life using special stages on private land and old railway tracks alongside the River Severn, including Burwarton Hall, the ex-army depot at Ditton Priors and running as far south as Gloucester. In 1977 it moved from the middle of the year to February in order to obtain additional forestry mileage. From then until 1982 the event experienced some atrocious weather conditions, such as deep snow and ice in Radnor, which led to the event being cancelled one year. From then on the event moved to its now traditional date at the end of May/beginning of June. In 1983 the Severn Valley Stages was invited to join the British Trials and Rally Drivers Association's (BTRDA), Gold Star Championship, this being acknowledged as the premier clubman's series in the UK. For seven years the rally formed a valuable part of the BTRDA championship until 1990 when, following the promotion of the Audi Sport Rally to international status, the Severn Valley was invited to join the Mintex National Rally Championship. This became the Association of National Championship Organisers (ANCRO) MSA National Gravel Rally Championship and the Severn Valley formed a key round each year until 2010 when the MSA decided not to continue with the championship. At this time the popularity of rallying historic cars was growing and the Severn Valley was invited to be a round of the MSA British Historic Rally Championship, a position retained until 2013. Over the years the Severn Valley has been a round of the Welsh National Stage Rally Championship, Clubman's Championship and Historic Championship. During the 40 years of the Severn Valley our title sponsors have included Alcan and Mutiny, but the one that sticks in everyone's memory is Kerridge. The Newbury based computer company first sponsored the event in 1989 and remained a staunch supporter until 2001. As a respected supplier to the motor industry the company found that the event enabled it to obtain very good penetration of its name in the independent motor trade journals, motor manufacture and importers' in-house magazines and the general public motor sport periodicals. The name Kerridge became synonymous with the Severn Valley Stages Rally. 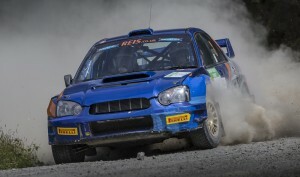 Mutiny, a UK technology company, followed Kerridge as a title sponsor until 2005 and since then event has returned to its original name of the Severn Valley Stages. With limited sponsorship from Powys CC Tourism Unit, Brightwell's Classic Vehicle Auctioneers and Brace's Bakery, the event has continued to run, sometimes at a financial loss. To celebrate our third successive year with support from our partners Rallynuts Motorsport Ltd, the event will be known at the Rallynuts Stages Rally from 2018. Details of championships and the event will be announced shortly. Thanks to you all for your friendly and welcoming approach and for laying on such a great event. Stuart Anderson Excellent event guys, thanks for a great day. Many thanks for a great event yesterday. The stages were brilliant the organisation superb . Look forward to seeing you next year. Hi Mark, just like to take this opportunity to say , what a well organised event i found the Severn valley to be, having been involved at varying levels on a great many rally's, it was one of the best i have attended, also the marshal food bags were quite exceptional ( compared to those given on other events ) If i can help on any other events, with which you are involved, don't hesitate to contact me. A big thanks from car 6 for an enjoyable and extremely well organised event. Once again, the event has shown it remains an extremely well organised machine! From my perspective - I couldn't fault the organisation or running of the event on the day. Just like to extend my thanks to all the marshalls and organisers for a really well run event, as usual. Been coming since 2005, (Rowand Prentice has been the start/finish marshall all those years!) and it has always been glorious weather. I hope the marshalls have managed to wash out the dust! A big thanks for an enjoyable and extremely well organised event. Once again, the event has shown it remains an extremely well organised machine! From my perspective - I couldn't fault the organisation or running of the event on the day. The Severn Valley was, as always, an excellently run event. I could look at individual components but as everything was to such a high standard it is unnecessary.